TAD: Who Can Explain Why Humans Think The Things They Think? What areas of knowledge should teachers examine to understand how human beings think and learn? If a PET scan, a thermal imaging device, or a MRI can’t see something is it really there? Is a Buddhist more likely to reach enlightenment now that we have seen how the cellular make up of the mind changes after prolonged meditation? Are scientific explanations enough to capture the full human experience? Maybe not, but I am sure there is a scientific explanation for why much of this blog came to me while I folded laundry on a Sunday evening. The recent sophomore project, TAD (Thinking Across Disciplines) emerged from several faculty conversations about pedagogy. One conversation debated how Cognitive Neuroscience can explain the mind of a human being and if this knowledge could improve the way we facilitate learning. 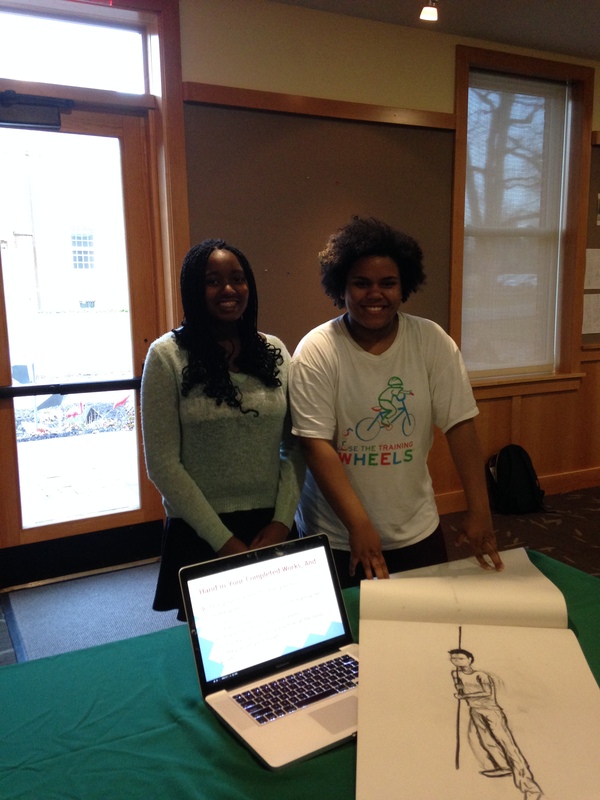 Two students pose during their TAD presentations. Chloe (pictured left) compared a crash course in figure drawing from her Painting and Drawing class with writing a pastiche in the style of William Faulkner’s As I Lay Dying for her AP English class. Research has shown that students who think metacognitively have a higher chance of success. It may be that all learning asks the brain to make connections between previously acquired knowledge but TAD asked students to go on a connection seeking exploration. Whether students found similarities or differences in the ways they learned in particular subject areas was not as important as the exploration they engaged in to reach these conclusions. We frequently claim that we want students to be more curious and more questioning. Paradoxically, many of us wince when we hear students question the purpose or worth of one assignment or another. TAD gives time and space for students to gain some understanding of why we ask them to translate Latin into English or examine the molecular qualities of a plant cell or evaluate a proof. Often we ask students to examine a Shakespearian passage, turn a potter’s wheel, or sing an aria—all before afternoon tea. Interestingly, giving students this time and space to think metacognitively prompted the adults involved to do the same. Here are some highlights from the conversations I had with my colleagues over the last couple of weeks. One colleague talked about a distinct difference that he saw between the way students think in the classroom and the way they think once they leave, and we talked about how TAD was just a small way of overcoming this divide. Other colleagues talked about how hard it was for students to work on an assignment that was this abstract. We wanted students to find their own way through the assignment and draw their own conclusions based on their own experiences. Other faculty talked about what they loved and hated about using a common rubric to assess presentations. Faculty who walked the students through an introduction to the program or coached the students through the process emphasized the emotional components of the student experience. Public speaking is always a challenge. Thinking abstractly demands intellectual risk-taking. Such things tend to spark a variety of strong emotions. Clearly our brains are not separated from our nervous system. Is it just that different synapses and neurons were spurred into action during preparations for TAD? Can neuroscience alone explain why some students spoke passionately about the opportunities they had to be creative in art but also in math? What factors contributed to students articulating how studying a Shakespearian soliloquy in theater can be so different yet so similar to studying the same soliloquy in English? Cognitive Neuroscience is just one of the many areas of knowledge that a teacher might call on if they are going to understand how students think and learn. It turns out that understanding thinking and learning is as interesting and as elusive as understanding human nature.